The other evening I met with a small group from my church here in Chattanooga. They’d asked me to update them on Ukraine, and on what our plans are after my fiancée and I marry in July. I told my friends how so many of my friends in Kyiv prayed as they protested three months for a change in government, and then saw God’s dramatic answer to prayer when the corrupt government of Yanukovich fled, abdicating power to the Parliament, where it belonged according to Ukraine’s constitution. Then I told them my perspective on the current conflicts in east Ukraine, based on what I saw while living in Kyiv, heard from my friends, and read in Russian-language Ukrainian news. One person asked me what I though Russia would do. I don’t know, I answered, but I know that God answered the street-protesters’ prayers after three months. My pastor in Kyiv called that a miracle of prayer. So we turned to Daniel 2, read the miracle of prayer there, when God saved Daniel and his friends’ lives in answer to prayer, and gave the promise that the kingdom of heaven will grow, crushing earthly kingdoms, and filling the entire earth. I’m encouraged that this is something God does, not us: the stone representing his kingdom wasn’t cut by human hands, but was a work of God’s grace. I don’t know what will happen in Ukraine. My heart breaks for the Ukrainian people, for my friends and the many I haven’t met, who simply long to live their lives in peace, to be allowed to run their country without interference from Russia or the EU, but with good relations with their eastern and western neighbors. So, we prayed. We plead with the God of heaven, who still answers prayer, who is still the King of kings, the Tsar of tsars, asking him to have mercy on Ukraine and protect her from those who would do evil. Join me in praying for peace in Ukraine. As the riot police withdrew, snipers opened fire on peaceful protestors, shooting them dead from building-tops in the city center. My disbelief turned to horror at the unfolding events downtown: Kyiv became a killing field on February 20th. A week later streets calmed in Kyiv, but Russian troops steadily occupied Crimea. Since the beginning of the protests, the prayer tent (pictured above) has been the heart of the protest. Ukrainian Christians have prayed there 24/7, just beside the main stage where the protests organized and the people found their new voice. Our church in Kyiv held frequent prayer meetings; our elders called us to prayer and fasting. Persistent over three months, non-violent protestors demanded truth. When the corrupt government fled overnight, our pastor called it a miracle of prayer, reminding us people prayed for seventy years under the corrupt Soviet Union. My team’s ministries alongside our Ukrainian church partners have continued through the stress of the protests, the rapid and surprisingly good changes within Ukraine’s government, and the uncertainty of Russia’s next moves. Tens of thousands of invasion-ready Russian troops have been massed on the Ukrainian border since early March. English Club was disrupted for a few weeks, but it has resumed. An uncertain future and the real possibility of war has created an openness to spiritual questions among Ukrainians, similar to the early 1990s after Ukraine gained independence from the USSR. Pray for Ukrainian Christians, that the church will live the reality that only Jesus’ grace and the power of his cross can renew their land. Pray for my team and others serving Ukrainians under these daily uncertainties. Finally, my fiancée Stephanie and I are seeking where we will live and serve together after we marry in July. We’re both excited to serve in Europe, using our skills and abilities to help Europeans strengthen their churches. Please pray for wisdom as we have conversations with potential future colleagues, and as we make decisions together. Thanks for your interest, prayers, and support! Today marks the beginning of my second year in Kyiv. A year ago today, while moving to Kyiv, I had an 11.5 hour layover in Munich–which I chose over a 4.5 hour layover where I would have only seen the airport. 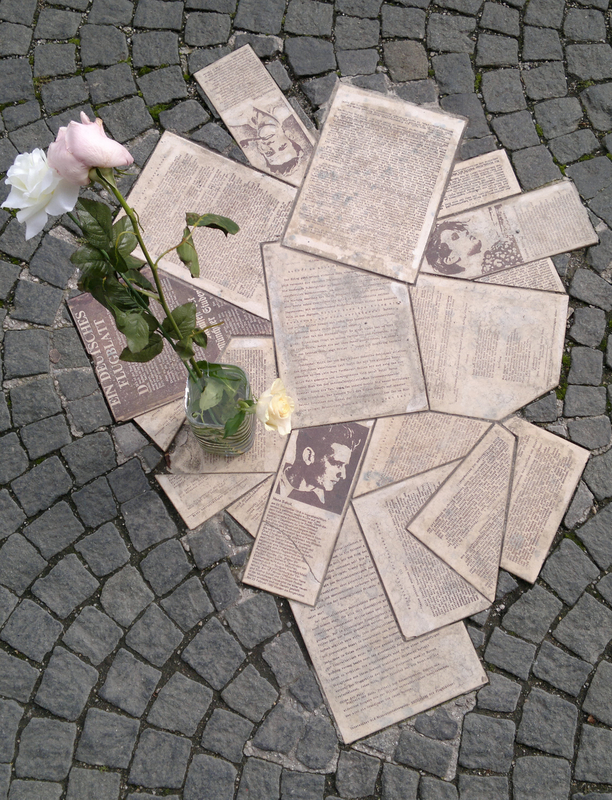 I hopped on the train from the airport to the city center with one primary goal : find the Hans and Sophie Scholl monument. Munich was full of men in lederhosen, and women in traditional dresses, all there for Oktoberfest. I grabbed a quick breakfast at a cafe, and set off to find the street which would intersect Geschwister-Scholl-Platz, the square named after the Scholl twins. When I found the street its entire length was a huge party for the Day of German Reunification; every German state had a booth with tourist info, food, drink, and lots of people. I walked maybe a kilometer up the street, found Geschwister-Scholl-Platz covered in festivities for the German reunification party, and eventually found the monument in the pavement. I was en route to Kyiv, but finding that monument mattered to me. Ukraine is a country that suffered greatly during World War II and under the Soviet Union. I knew a little of the Scholl’s story, enough to know that their connecting their Christian faith with actively standing for truth, was something I wanted to learn about, and is something I believe is still relevant today. 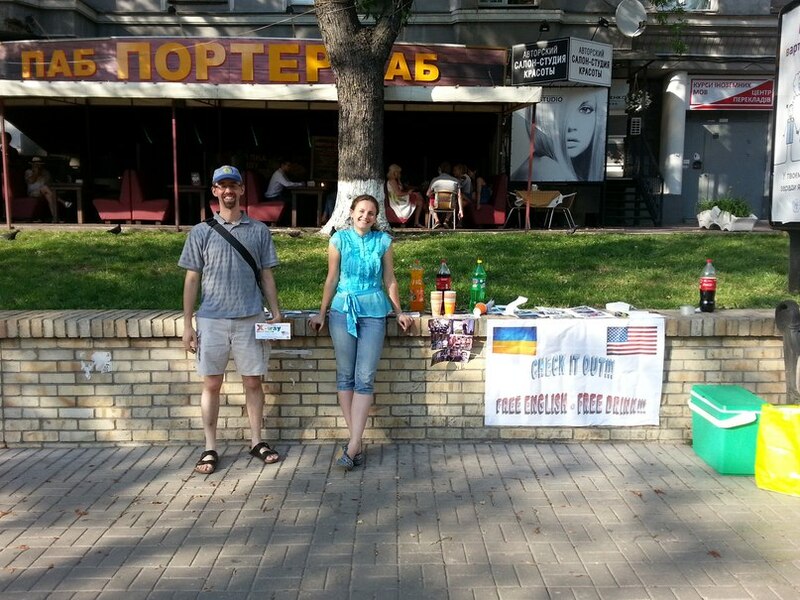 Perhaps more than anything, what Ukraine, Europe, or the United States need today is a solid basis for hope. Hans and Sophie Scholl have been heroes of mine ever since I first read of them as a college freshman. During World War II, the Scholl twins were part of a small group of university students in Munich who published a series of pamphlets from June 1942 through February 1943 informing people about the evil the Nazi government was pursuing, and calling people to stand against it. Hans and Sophie were eventually arrested by Nazi secret police, tried in what was by all accounts a show trial and travesty of justice, and beheaded, along with five of their friends and fellow-students, who had helped write and distribute their pamphlets. I felt that their story mattered deeply, and that in coming to Ukraine it was worth the stop to find their monument, to gain a little more understanding to their commitment to truth. They believed that loyalty to truth ought to drive us to action, to standing against evil in the world, with a willingness to die if necessary. During his interrogation at the hands of the Gestapo, Hans Scholl stated, “I knew what I took upon myself and I was prepared to lose my life by so doing.” Wow. You don’t make that kind of decision without a commitment to truth and solid hope for the future. But some have this idea that truth is for hard-nosed people, that you either care about truth or you care about people, that truth is only facts, and hope is just an irrational feeling. Was that the case with Hans and Sophie? Or did their loyalty to speaking the truth actually illustrate the deep love they had for their neighbors and hope they had for their future, for the men and women who lived in German cities, who were all around them but largely silent in the face of fascist atrocities? Jesus himself said, “Greater love has no one than this, that someone lay down his life for his friends.” Their loyalty to truth, to living their lives out of their deepest commitments and hopes, still speaks today. Though not Ukrainian, Hans and Sophie Scholl provide a much needed example of people who weren’t content to remain silent. They cried out, giving their lives as a witness to the truth. There are still many things broken and wrong here, systemic corruption, and deep cynicism about the government. However, this isn’t unique to Ukraine. I have plenty of friends back in the United States who are deeply cynical about the state of things there. Some think gargantuan corporations run the entire show with their Republican friends by simply pursuing the almighty dollar and a pound of flesh, others think leftist and statist liberals are out to destroy or remove constitutional freedoms. All over people are concerned about the potential of terrorist attacks. Whether confronting hard historical realities that still reverberate here in Ukraine, facing deep challenges to constitutional liberties and social order in America, or facing unpredictable terror, I think a primary question is how to give hope for the future. And I’m not naive: neither people nor cultures change overnight, but they can change. When a man lays down his life for his enemies, and then rises from the dead three days later, that can change the world. That gives real, substantial hope as it reverberates through history. That hope is something solid, not just a wish—its a foundation lives can be built on, truth to which we’re called to live in response, and hope for cynical cultures. I’m beginning my second year here. How much can I really do, as a foreigner? I’ve just made a start learning the language, with only 11 months under my belt. I worship with Ukrainians Christians, serve our community through an English club, am investing in relationships with friends I’ve met here, and am helping a small group start a new church. Why? I long to give hope, to bear witness to the truth, to stand against cynicism and help Ukrainians, Europeans, and Americans display this hope for their own cities, and point to the empty tomb that gave birth to a new humanity of women and men with hope. A lot of my Ukrainian friends really liked it, and asked for the recipe, which I’m providing below. Priyatniva appetite! Плотно закрыть и выпекать 30 минут. Cover tightly and bake 30 minutes. come to our English camp! Hello friends, if you’re in Kyiv and would like to improve your conversational English, come to our English camp. I’ll be one of the teachers at X-Way 2013: The Game, the tenth annual English camp my friends here in Kyiv have organized to serve English learners in Kyiv. Details and registration are at www.xwaycamp.com. And as an additional bonus, if you can find me or my friends this Friday or Saturday in the center of Kyiv, we have an English reading test for you. If you can read the first few paragraphs with minimal pronunciation mistakes, you’ll win a free, cold drink. If you’re able to read the entire poem with no more than five pronunciation mistakes, you’ll receive a discount on your English camp registration fee. I hope to see you soon, either downtown, or at the English Camp later this month. Happy learning! On Fridays in my Russian class I’m learning words about God, слова о Боге. Yesterday, we reviewed last weeks theme, which was words about the Bible. My teacher asked me to say sentences following the patter, “The Bible is _____.” I’d already covered things such as, God’s word, absolute truth, a historical book, the history of redemption, and the book inspired by God’s Spirit, but when I tried to say the Bible is the living Word, her response was, “We don’t say that.” I told her I thought there is a phrase like that in the Bible, at least in English, and we made part of my homework finding the phrase—which I couldn’t remember then—and finding its equivalent in Russian. I got pretty close, but made a number of mistakes. First, I forgot the “к” for the phrase, “к кому,” using the dative form of “whom” but forgetting that the verb of motion, пойдем, requires the “к кому.” Second, I misspelled the verb, we will go, пойдем. Third, though I got the Russian syntax of ‘You have” correct (horray! ), in the present tense its not necessary to use, “есть.” Fourth, though I knew I needed a nominative plural ending for “words,” I confused genders and cases: слово is neuter nominative singular, so the correct plural would be слова, but somehow I was thinking the ending drops off leaving just the stem—слов, but that would be a feminine genitive plural ending—nonsense for what I was trying to translate. Fifth, I omitted the present participle of “to give”, дающие (giving), and simply rendered it as, “you have words of eternal life,” but that’s mostly because we haven’t learned any participles yet in class. Sixth, I used a past tense for “have come to know,” so said, узнали “we knew” and missed that this is a past action with continuing effect, but the Modern Russian translation uses the simple present, “to know.” And last, I tried to render “the Holy One of God” with the nominative singular for the noun, “holy” plus the genitive singular for “of God”, but I used the wrong ending on for holy, Святой. Technically, I translated Бога, “of God,” correctly, but apparently the Modern Russian makes the stylistic choice to use the adjective form of God, Божий, for which we don’t really have an equivalent in English (our word, “godly” is different because it describes people who are like God, whereas Божий only refers to God). ἀπεκρίθη αὐτῷ Σίμων Πέτρος· Κύριε, πρὸς τίνα ἀπελευσόμεθα; ῥήματα ζωῆς αἰωνίου ἔχεις, καὶ ἡμεῖς πεπιστεύκαμεν καὶ ἐγνώκαμεν ὅτι σὺ εἶ ὁ ἅγιος τοῦ θεοῦ. Whatever the language, and in spite of my mistakes and misunderstanding, I’m deeply grateful that Jesus has the living words, and gives them to us by his Word and Spirit. 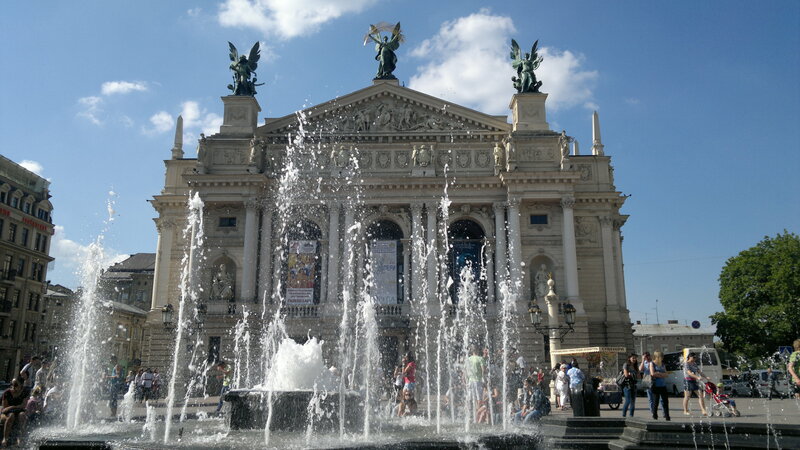 The Lviv Theatre of Opera and Ballet, which I took during my day off there last month. This beautiful building, designed and built by a Polish-born, Berlin-trained architect, Zygmunt Gorgolewski. He won a municipal design competition, and managed to fit the building into the already built city-center with his proposal to enclose the Poltva River underground. The Theatre and the tree-lined boulevard created by his design are beautiful. Yesterday in my Russian class, while discussing reasons why people enjoy going on excursions, my teacher told me, “of course, to see достопримечательности.” Well, she realized I didn’t know the word, достопримечáтельность, which is a noun meaning for an interesting place. And I couldn’t help but think of my classmate Helen, who’s left for the USA, but who loves these incredible sounding Russian words. So apparently, its not just the Germans who enjoy scrumptious mouthfuls of syllables in single words. I guess if we were playing Scrabble again in Russian, at least three of us would need to gang up to play достопримечательность… if it even fits on the board! I have been called by Mission to the World (MTW) to work with the MTW Kyiv team in music ministry, evangelism, and discipleship.